No B.O.! 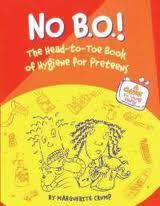 The Head-to-Toe Book of Hygiene for Preteens by Maruerite Crump. This frank, reassuring, humorous book covers the physical changes boys and girls experience during puberty and offers tips on caring for one from head to toe. Pp. 118. This entry was posted in Adolescent/Transition Issues, Our Library and tagged adolescent, hygiene, puberty. Bookmark the permalink.